Situated in superb central location, this stylish one bedroom top floor flat offers a spacious and bright reception room and a contemporary open-plan kitchen. Harewood Avenue is a superb location with a wealth of central London shops, bars and restaurants within easy reach. The green open spaces of Regent's Park are also close by. One of the largest mosques in West London, also providing a cafeteria, library, attire and book shop. 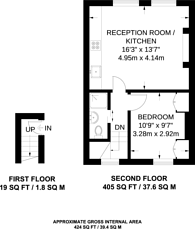 424 (39 Sq M) approx. We have over 1,000 property market reports for locations across London and Surrey - including NW1 and Marylebone.